Elaine Binney (vln); Rachel Mate (vcl); Richard Gilroy? (gtr); ?? (keys). Next Thursday, June 7, is our jazz contribution to the Blaydon Races Festival (150th anniversary). We are delighted to bring back John Hallam accompanied by the Paul Edis Trio. John is a player of great popularity throughout the UK - Getzish tenor sax, Mulliganesque baritone sax and Goodmanish clarinet. Quite a combination. Put that with John's amiable personality and dry wit and you have a good, swinging time guaranteed. Its 8.30 start - £6 admission, on the door. Also a mention of our summer concert on Thursday July 5. 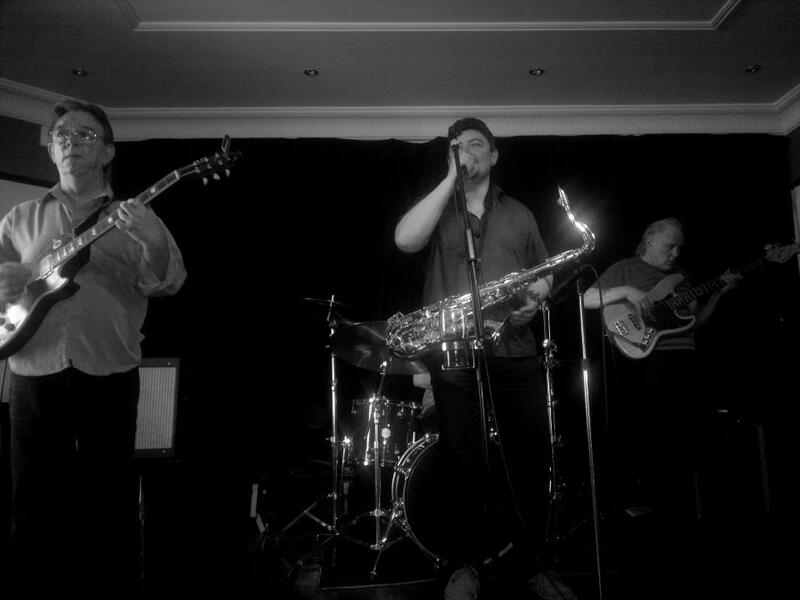 James Birkett gtr, Jeremy McMurray pno, Graeme Wilson sax, Mick Shoulder bass and Adam Sinclair drms. An all star line up of top local jazz players. And we are having a DIY buffet (please bring some small food contibution). 8.15pm start to allow for a longer break and £5 admission. 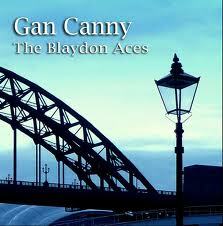 Also The Blaydon Aces are at The Lit and Phil Wednesday June 13. An evening of local dialect songs. Contact L&P for tickets. Lots of music from Zoe here. Check out Zoe Gilby's YouTube page. 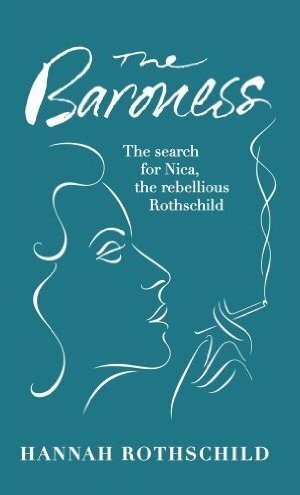 Book review: The Baroness by Hannah Rothschild. Suddenly she's everywhere in my life. A BBC documentary (The Jazz Baroness), a DVD of the same plus, a biography by David Kaskin - Nica's Dream - and now this! The Baroness by Pannonica Rothschild's great niece Hannah. I devoured the pages - how could I not? I think I fell in love with the Baroness when I first read about Charlie Parker dying in her apartment whilst watching the Dorsey Brothers' Show on television! To an impressionable 15 year old whose parents had yet to acquire a television set the idea of a jazz musician dying in the New York apartment of a beautiful Baroness whilst watching other jazz musicians on tv seemed to me to be the ideal way to go! Of course if I'd realised at the time the tragi-drug related circumstances described in the book I may have removed the rose tinted glasses. Is this the most unusual band line-up of the year? Yes, this must surely be it, a very odd but fascinating band! A pianist who also sang, a flute, clarinet (ok so far); but also a baritone horn, a steel pan, and two women singers. This was part of a special concert to celebrate 50 years of Amnesty International. Dionne Warwick (vcl); Jeff Lewis (dms); Danny De Morales (bs); Todd Hunter (keys); Sam ? (perc); ?? (pno md). South Bank Sinfonia Strings. Looking much younger than her 72 years (mind you I was back in row U) the diva celebrating 50 years in show business gave a polished and entertaining performance. The hits came tumbling out - there were many and I remembered every one of them! Walk On By; Anyone Who Had a Heart; You'll Never Get to Heaven if You Break my Heart (honestly! ); I'll Never Fall in Love Again (the magnificent rhyming of pneumonia with phone ya! ); This Girl's in Love With You; Say a Little Prayer For Me; Alfie; Heartbreaker (we all sang along on that one!) Do You Know The Way to San José? What The World Needs Now and so on. Hall One was close to capacity and at the end the lady was awarded a deserved standing ovation. It wasn't jazz but we didn't expect it to be. It was quality pop singing that will perhaps encourage me to dig out my vinyl. Alexander Stewart w. Alex Webb Trio @ The Sage. Alexander Stewart (vcl); Alex Webb (pno); Gary Crosby (bs); Andy Chapman (dms). I felt that the support act to Ms Warwick deserved more than the typical ...earlier on so and so opened the show etc.. this was a strong performance in its own right. Stewart is often compared with Michael Bublé and there are similarities. However, just as there once were and still are a thousand Sinatra clones - of which Bublé once was one - the Canadian has now found his own voice and Alexander Stewart is pretty damn close to finding his. Dave Brown a Bishop Auckland based drummer is looking for jazz gigs. Contact Dave on 07746 101395. Schmazz at the Cluny on the South Side! A one-off relocation south of the Tyne to the Central Bar in Gateshead to present Troyka paid dividends - a full house, no less. Well, it helped that guitarist Chris Montague, a Gateshead lad, had the Montague Clan (grand mother et al) in attendance to lend support in numbers. The trio arrived late due to the band bus (aka humble car) breaking down en route to Tyneside. It was agreed to play one long set rather than the regulation two sets. On a warm night make-shift fans were fanned, brows mopped, beers quaffed. The Sage is number 2 Concert Venue. LondonJazz lists the the UK's top 100 concert venues (compiled by PRS). The Sage, Gateshead, is up there at number 2, with Newcastle's 02 Academy number 8 (there are three 02 venues in the top 8), Customs House, South Shields, is 59 and Darlington Arts Centre is in at 80 which is ironic as it is soon to close owing to lack of funding. London's South Bank Centre tops the list. Talking about The Sage, don't miss Dionne Warwick there tomorrow night - not least because the support act is Alexander Stewart backed by the Alex Webb Trio. The full Scarborough Jazz Festival Brochure is now available and this - the tenth - looks to be a good one. Keep the weekend of Sept. 28-30 free it's a must be there event. Compered as ever by Alan Barnes the list of performers include Claire Martin, Martin Taylor, NYJO, Abram Wilson, Gareth Williams, Darius Brubeck, Matt Wates, Tim Garland, Sarah Ellen Hughes' Sector 7, to name but a few. In between sets, in the bar, the Jim Birkett Trio will be present with perhaps a guest or two sitting in. Possibly because of the informality of these sessions guitarist Birkett has dropped James in favour of Jim which augurs well for some nice swinging relaxed jazz guitar. Once again organiser Mike Gordon has delivered the goods all it needs now is for folks to buy tickets which they can do by following this link. Thanks to Colin A for this poster. In January Splinter at the Bridge offered Noel Dennis the chance to play the music of Miles Davis. The initiative was rewarded with a good turn-out on a bitterly cold night. Fast forward to early summer and another good crowd gathered to hear the music of Charles Mingus. Andy Champion picked a few familiar Mingus tunes and asked a few of his musician friends to play them. Better Git It in Your Soul and Pithecanthropus Erectus were given the perfect treatment; Alex Leathard (trombone) and reeds virtuoso Graeme Wilson pitched their solos just right, the rhythm section cooked and on cue the ensemble roared (Mingus-like). The spirit of Mingus and his sidemen – Dannie Richmond, Booker Ervin, Jimmy Knepper, Horace Parlan et al – was in the air throughout two most enjoyable sets. The mocking rage of Fables of Faubus and the beauty of Orange Was the Color of Her Dress, Then Blue Silk sketched a portrait of Mingus; the colossal angry presence, the prolific composer, the performer, the man. Was this an exercise in nostalgia? Not at all. This was great music played by some great musicians. Oh, yes - we did get a bit of nostalgia – Nostalgia in Times Square. Oh, Yeah! Info on Green Festival wanted. Can anyone confirm band times for the Newcastle Green Festival in Leazes Park this weekend. I know the Northern Brass Monkey's Band - sorry the Northern Monkey's Brass Band (nee Horn Dogs - they're nee more) are on Sunday at 4:30pm. Gordon McGregor, clarinet, soprano and alto sax, joins the Vieux Carré Jazzmen tonight at the Corner House, Heaton Road, Newcastle. Showtime 8.30pm; entry £3.00 at the door - and the good news is that the function room bar will be open from tonight and in the future - green shoots of recovery, eh! It's all happening for The Blaydon Aces (Roly Veitch (left), gtr/bjo/vcl, and James Birkett, gtr/bjo) - not only are they appearing tonight at The Cherry Tree (who knows but that they may have Stottie Cake on the menu), The Lit and Phil on June 13 and a revised version of their popular CD Gan Canny featuring original versions of Tyneside songs has been re-released but Roly Veitch will also be interviewed on Radio Newcastle today between 4pm and 5:30pm on the Jon Harle/Anne Leuchar's Drivetime programme - it's 45.20 in. Okay so it's not jazz but the CD includes some original material and the accompaniment and solos by the two guitarists are worth listening to even if you were born within the sound of Bow Bells! Irving Berlin is Composer of the Week. Radio 3, starting today at 12 noon (repeated at 6:30 pm), Monday to Friday. The Groove-A-Matics @ The Magnesia Bank, North Shields/ CD Review "Gotta Use What You've Got"
John Whitehill (gtr); Mick Cantwell (vcl/ten/hca); "Crutch"? (bs); Barry Race (dms). (Photo courtesy of Amanda Morgan). Winners of the Harvest Jazz and Blues Festival Battle of the Blues Competition, the G-A-Ms warmed up with a storming gig prior to their appearance at the actual festival which is held in New Brunswick, Canada, in September. Regular bass guitarist John Morgan is incapacitated - the reason some previous gigs were cancelled - but dep "Crutch" ensured that this show went on. Barry Race stokes things up with a relentless, almost hypnotic beat as saxist, harpist, vocalist Mick Cantwell delivers the poetry to a melange of Rock 'n' Roll, Rhythm 'n' Blues, Funk 'n' Soul, "Baby done me wrong" songs interspersed with King Curtis tenor blasts. Close your eyes and you done left North Shields for the South Side of Chicago and you're listening to Muddy Waters or even Louis Jordan. On guitar one of those local legends - John Whitehill - proves that he still has it. Blistering blues lines, chordal thrashes and a variety of original compositions that hold their own alongside the covers. A good gig that, if you missed it or can't make it to Canada in September, can be re-created by grabbing a copy of their CD Gotta Use What You've Got. 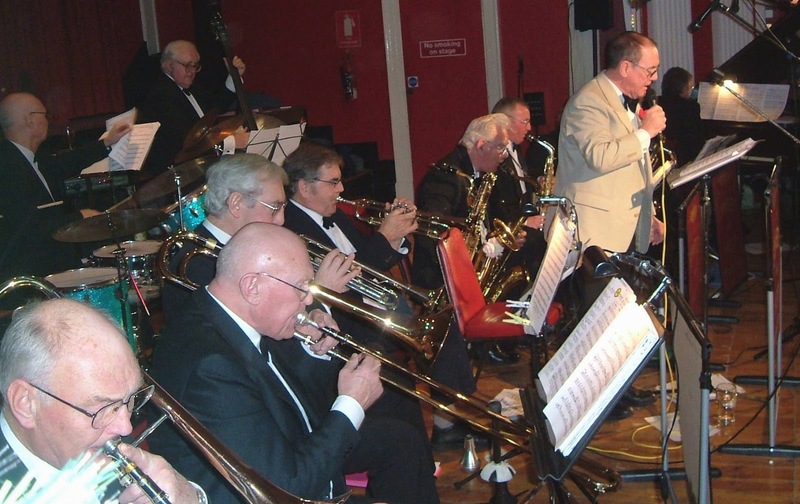 Ray Shenton and his amazing Victory V Jazzmen will be providing the Trad Jazz for Great Whittington's Diamond Jubilee Jazz Picnic on Sunday 3rd June 2012 from 12 noon onwards. The Picnic/Street party will be held in the garden of the repaired Village Hall and the band will play from a covered trailer in the field opposite. Entry is £6 for adults, £2 for kids, under 2's free and just bring a plate of food per person for sharing for the party. There will be a bar providing very reasonably priced drinks. Bring a folding chair just in case we run out of chairs. The band line up will be John Cowan, trumpet, Jim McBriarty,clarinet, Iain Macaulay, trombone Davies Wilson, banjo, Peter Shenton Bass, Olly Rillands, drums and Ray Shenton on piano and harmonica, together with surprise guests. 5 study classes at Wylam Institute starts 9:30 a.m. Tuesday 16th October, 2012. The popular American Songbook was one of the glories of the 20th Century, now sometimes dismissed as “easy listening” or “show tunes”. The new 1920s, 30s, 40s, 50s songs of Jerome Kern, Irving Berlin, George Gershwin, Cole Porter, Richard Rodgers - first written for sheet music, records, theatre, radio, movies – proved enduring for all time. The lyrics of Oscar Hammerstein, Ira Gershwin, Johnny Mercer, were rich in a word play of everyday speech, flip and witty. For reasons best known to themselves Horn Dogs, that excellent 8 piece New Orleans Marching Funk Brass Band, has changed its name to The Northern Monkey Brass Band. I'm sure there is some deep underlying logic behind this - is there a band of the same name (Horn Dogs) in New Orleans threatening to sue? Even so it isn't a name that grabs me - I suppose Monkey rhyming with funky might have some PR possibilities but sorry Graham I'm going to have to wait for this one to grow on me. Mind you, I said the same about Gerry Dorsey when he changed his name and look how he ended up! 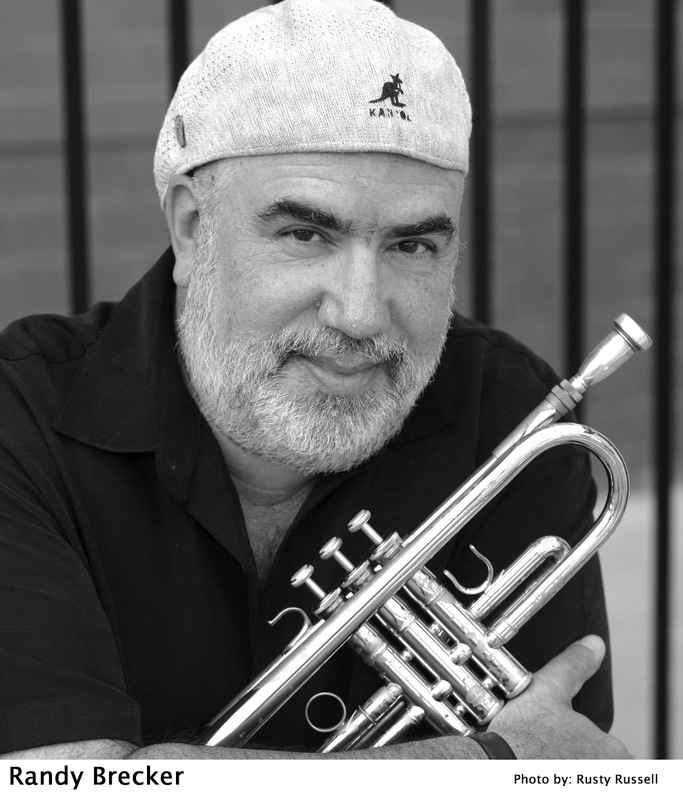 Randy Brecker w. SNJO and Edinburgh Schools Jazz Orchestra, Queen's Hall, Edinburgh May 25. Randy Brecker (tpt) w. SNJO - Ryan Quigley, Tom MacNiven, Cameron Jay, Lorne Cowieson (tpts); Chris Greive, Phil O'Malley, Kevin Garrity, Michael Owers (tmbs); Martin Kershaw, Paul Towndrow (alt); Tommy Smith (MD), Konrad Wiszniewski (ten); Bill Fleming (bar); Steve Hamilton (pno/keys); Kevin Glasgow (bs); Kevin Mackenzie (gtr); Alyn Cosker (dms). This was an incredible evening - a living legend in the form of Randy Brecker, arguably the world's best big band and a youthful ensemble that may one day be playing with them. The big picture was a tribute to the late Michael Brecker, younger brother of tonight's headliner. All compositions were by Michael Brecker and the variety and the authoritativeness of his writing showed just why he'd won so many Grammys. Big brother Randy displayed an awesome technique both open horned and muted as well as by occasionally incorporating various effects units. Not that this was a case of USA 5 Scotland 1. Drummer Tony Levin died some fifteen months ago. A stalwart of the British modern jazz scene and for many years a committed participant on the European free jazz scene, Deep Joy would have won his approval. Formed to celebrate Levin’s legacy, the musicians hold him in the highest regard. Reeds virtuoso Paul Dunmall and bassist Paul Rogers worked with Levin for many years, notably in Mujiician. Indeed the free-jazz group with Levin behind the traps played a final concert a little more than 100 metres from the Central Bar in Gateshead Old Town Hall before he became too ill to continue working. Jazz Bar Quartet @ Jazz Bar, Edinburgh. Thursday May 24. Colin Steele (tpt); Brian Kellock (pno); Ed Kelly (bs); Bill Kyle (dms). This quartet of stalwarts was put together at the last minute ye,t from bar one, it sounded as if they had been playing together for years! Colin Steele, last heard in the role of Chet Baker in the play A Funny Valentine, has absorbed much of the tragic American's style. Steele knows his barriers and doesn't attempt to vault them instead works well within them. So many lyrical phrases - and with a tone to die for - made his playing a delight to listen to. On piano, Brian Kellock is right up there with them - there may be better pianists but, off hand, I can't think of any. On bass and drums, Kelly and Kyle kicked things along swinging like crazy when insanity was called for - Sonnymoon For Two - soothing and tender when gentle cajoling was required such as on the beautiful Blame it on my Youth. Other moments to treasure were When Lights Are Low, Tangerine, Black Orpheus and But Not For Me which endeth the first lesson. I'd like to have hung around for the second set but the number 31 bus beckoned. Nice to meet Kieren Alexander - an Australian - who has sent me some excellent photos of the gig - one of which is on this page with another three to add - thank you Kieren. Photos by Kieren (first 4). The Sage Gateshead’s cockpit theatre Hall Two welcomed Dennis Rollins’ latest project featuring in-demand organist Ross Stanley and the much-heralded young drummer Pedro Segundo. Stanley, first to solo (Samba Galactica), met expectations with some smokin’ grooves and a Rollins’ composition – Emergence (Time-Come) – inspired by the revered organist Larry Young set the gig on the right course. Stanley and drummer Segundo brew up the proverbial on one tune after another. Rollins’ Caribbean roots became evident in a Bob Marley influenced number - Ujamma - not dissimilar to Jammin’. Tommy Smith and SNJO Funding. As the Scottish National Jazz Orchestra prepares for tonight's Tribute to Michael Brecker concert at Edinburgh's Queen's Hall leader Tommy Smith spoke out against funding cuts which threaten his and the orchestra's future. 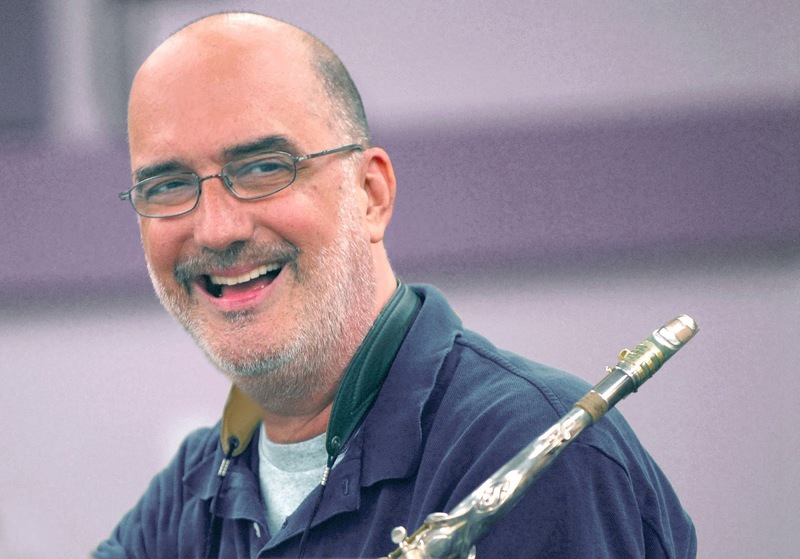 The mini-tour which features Michael Brecker's brother Randy Brecker began last night in Lanark and continues after Edinburgh to Glasgow and Kirkaldy. 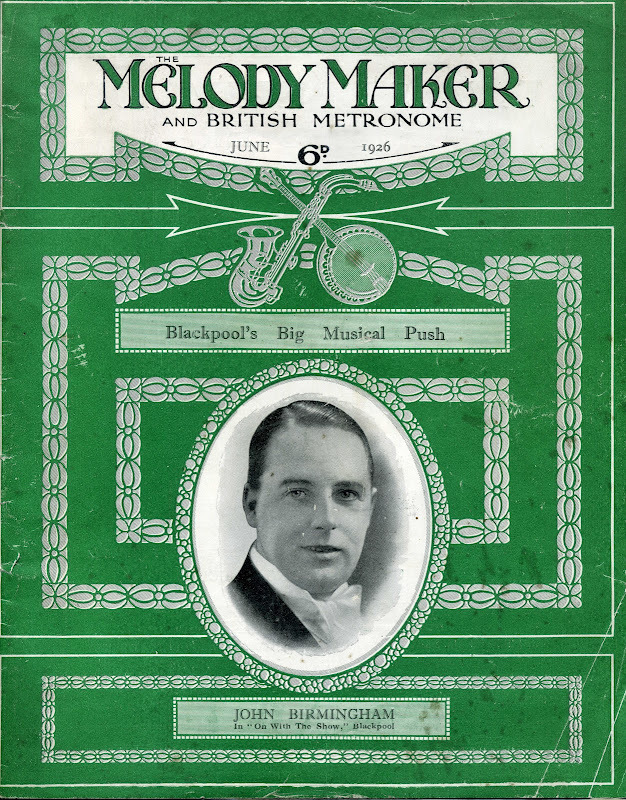 Melody Makers 1920s - 1960s. (over a 1000 pages of jazz and dance music news). Third Granddaughter for Bobby Carr. James Carr, son of the legendary trumpet player Bobby Carr who is never far from these pages, reports that his (James') partner Gemma gave birth on May 12 to a baby girl - Lily. If Bobby had still been with us this would have been his third granddaughter. As many of you will be aware last night's advertised concert at The Sage Exploring Music - The Great American Songbook with James Birkett and Katherine Zeserson didn't take place owing to Ms. Zeserson being taken ill late afternoon. However, a replacement session has been arranged for Wednesday June 20 which will help to alleviate the disappointment felt by Gasbook enthusiasts. I hope this finds you well and in the swing. My annual 'nooks and crannies' tour is approaching soon. Realize it's tricky in summer but I really look forward to seeing you (all) again if possible. Lucky to book some different spots this year so I'll get to see more of your fine country. Two acclaimed musicians who call Durham home will be performing “Jazz on a Summer’s Night” in the City on Saturday 9th June at 7.30 pm. The venue is St Chad’s College on the North Bailey; the tickets cost £12 (concessions £8, students £5) and are available from the Gateway World Shop in St Nick’s Church, Durham Market Place, or on the door. Prize-winning pianist Paul Edis, who grew up in Durham and attended St Leonard’s School, is recognised as an outstanding young British musician. He will accompany the astounding American vocalist Sandi Russell, who was born in New York City but now makes her home in Durham City. A regular performer at London venues such as Ronnie Scott’s, Pizza Express and the Southbank Centre, Sandi has also appeared at the Gala, the Sage and Northern Stage, but this is a rare opportunity to hear her so close to home. More information about Sandi Russell can be found on her website (given below). On Safari in Pink Lane. 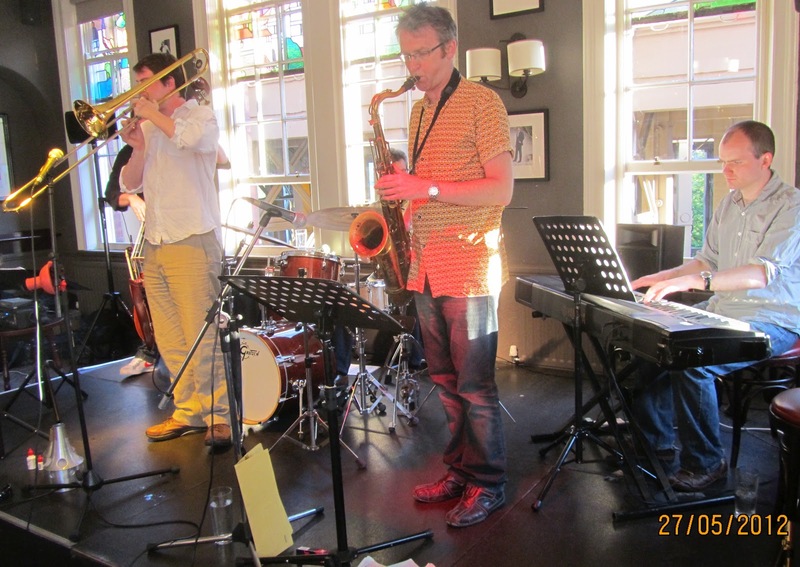 You should have been in Jazz Café on Sunday! Three young Chinese students (girls) screamed "It's a bat!" It wasn't of course, it was a very large Queen Bee. The bee settled between the back of the bench seat and the window. Enter the Great White Hunter - Keith Crombie. Alas, even his attempts to encase the enormous insect inside a pint glass failed and it looked like Rentakill or a Rapid Response Squad (they know where the Jazz Café is) may have had to be called in. However, a very brave student managed to get the honeybearer into the glass and whip a CD over the top to stop it escaping whereupon it was subsequently released into the wild - Pink Lane. When one of the girls said "What happens if it tries to get back in"? Crombie said that he wouldn't let it in as it didn't have a student's union card. There are moments when KC does have a sense of humour. PS: I've re-posted it here for the benefit of those not on Facebook. Graham Hardy w. Paul Edis Trio @ The Cherry Tree. Graham Hardy (tpt/flug); Paul Edis (pno); Neil Harland (bs); Rob Walker (dms). After his recent incarceration with the Vieux Carré Jazzmen I feared that Hardy may have become a born again revivalist with a Mutt Carey vibrato and a beard. Fortunately, he came through unscathed retaining his Art Farmer, Lee Morgan, Nat Adderley approach although he has added Do You Know What it Means to Miss New Orleans to his repertoire - a number that featured him very effectively using a plunger mute - shades of Cootie Williams. Whilst sitting in this musical heaven I was waited on by handmaidens bearing Shredded Crispy Duck Salad, Sesame and Soy; Navarin of Spring Lamb with Young Vegetables; and Elderflower and Ginger Jelly, Marinated Watermelon and Strawberries. And if this wasn't Shangri-la enough, I discovered that the 33A bus from outside of the restaurant links up in town with the good old number 27. Next week it's a celebration of 150 years of the Blaydon Races featuring the Blaydon Aces (Roly Veitch and James Birkett). Alan Barnes/Greg Abate Quintet @ Corner House, Newcastle July 12. When we discovered the US sax player Greg Abate last July we just knew we had to put him together with the UK star Alan Barnes. They are a perfect fit and guaranteed to provide North East lovers of mainstream jazz with a great night's entertainment. They were so keen to renew an acquaintance they made some years ago that both agreed to fit in this one-off Northern appearance in the middle of a hectic festival season in the south. Don't miss the chance to hear them. Backing them are two thirds of the Paul Edis Trio - Paul himself will be at one of Alan's stop-offs, the Swanage Festival, with ACV. He's replaced by one of the North East's most experienced keyboard players. Capacity at the Corner House is limited so we recommend you to buy your tickets early and avoid disappointment : Alan Barnes has a tendency to fill venues, particularly in the company of such an illustrious front line partner. Tickets are on sale now at J.G.Windows in the Central Arcade, Newcastle. Available now at J.G.Windows Music Store, Central Arcade, (Connects Grey Street, Market St., and Grainger St.) Newcastle. Tel.0191 232 1356. 8:00pm. And so to the second set. Free into Edinburgh, a tune written by guitarist Aubin Vanns, was in the pad the last time the band made it to Newcastle and it was good to hear it again. For one so young Vanns is a most accomplished musician. An intro recalling the majestic playing of Martin Taylor gave little indication of what was to come. Matt Anderson’s tenor work evolved into an intense, yet restrained, post Coltrane sound freeing Vanns to construct yet another immaculate solo. Anderson’s Sfumato (inspired by Leonardo da Vinci) featured first the composer, then Vanns, followed by the superb drummer Sam Gardener. A standard – Moanin’ – was a real surprise. The Blakey drive, press rolls and all were stripped out. Which one of them would take on Lee Morgan’s killer intro? Ha! None of them. This was the coolest deconstruction of one of the great tunes. I don’t know…a young quartet daring to play as they did, secure in their abilities, trusting of one another, a collective sense of time (check out Sam Gardener) – what a band! A couple of Anderson originals – The Frozen Ocean and The Song Thief - closed out the set. Bassist John Marley featured on the penultimate number and the last tune of the night highlighted the beautifully modulated work of tenor and guitar. The boys return to the Bridge next month working in a seven piece band led by the fantastic vocalist Kate Peters. Whatever is on the telly that night forget it (record it if you must), you can listen to your Charlie Parker CDs some other time, just make sure you get to the Bridge Hotel on Sunday 10 June to hear the Kate Peters Septet. The Matt Anderson Quartet @ The Bridge First Set. Matt Anderson (ten); Aubin Vanns (gtr); John Marley (bs); Sam Gardner (dms). This was another WTFWY? gig at The Bridge. The Anderson Quartet play it with a Frigidaire coolness that belies the fire burning at the heart of their compositions and they deserved to be heard by more than the scant few who tackled the stairs to the upper room of this historic pub. Blues for Wayne (Shorter) got things rolling before kicking in with a couple of pieces from Anderson's specially commissioned Songs of the Ridings - first heard (by me) at last year's Scarborough Jazz Festival - Cold Spell and The Hermitage. I'd liked to have hung around for the second set but circumstances decreed otherwise. However, co-pilot Russell did and his report follows soon. Badbone man Dennis Rollins is a busy man with a busy schedule. The trombone funk master stops-off in Gateshead later this week with his Velocity Trio. The band features Rollins with Hammond star Ross Stanley and the sensational young Portuguese drummer Pedro Segundo. Rollins boasts an impressive pedigree; early recognition came as a member of the famed Doncaster Youth Jazz Association which led to an offer from Bill Ashton to continue his jazz education in the ranks of the institution that is the National Youth Jazz Orchestra. 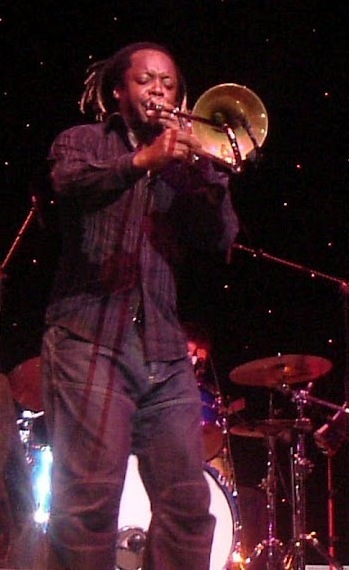 Rollins’ jazz funk approach led to professional engagements with the seminal big band outfit Jazz Warriors, UK superstar Courtney Pine (a recent and frequent visitor to The Sage Gatesehead), a see-the-world tour with Jamiroquai, funking it up with funksters US3, soul jazz funksters the Brand New Heavies and by no means least his on-going association with the one and only Maceo Parker. Just wondering how Paul Grainger's doing - anybody know? He went in for an op on his heel earlier this month and I haven't heard any more apart from the fact that it could be, literally six weeks before he gets back on his feet. Bass players like Paul shouldn't be allowed indispositions - they're too precious. So if someone can keep me informed, or if Paul reads this, let us know how he's doing. Get well soon Paul - rhythm sections need you. Deco Heart @ The Lit and Phil. Friday May 18. Lucian Ban (piano); Mat Maneri (viola). New York’s Downtown scene offers the listener a seemingly endless choice of first rate musicians to get to know and sometimes love. 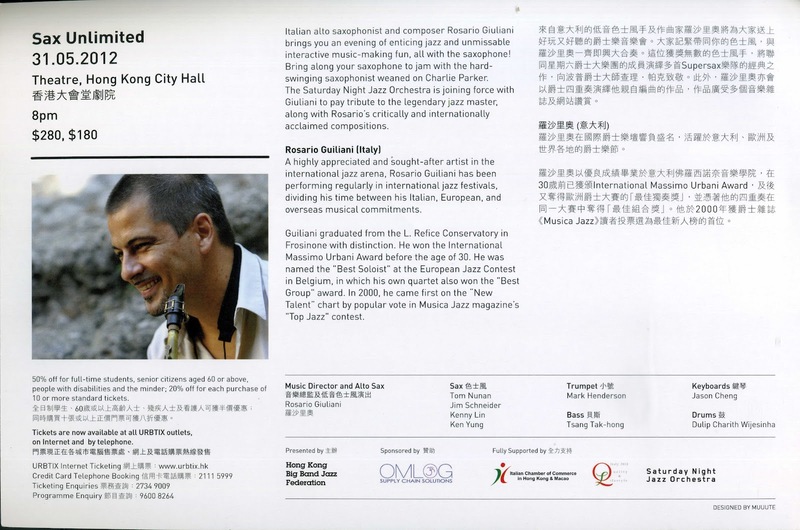 Romanian pianist Lucian Ban, resident in the Big Apple, first appeared on Bebop Spoken Here’s radar last year when he visited The Sage with his Enescu project. Ban and the stellar line-up of musicians in tow gave a gig of the year performance. One of the string players in the band was viola player Mat Maneri. He was known to north east audiences having visited Newcastle on several occasions. Sweet and Hot on June 4. John Carstairs Hallam's Sweet and Hot Orchestra are "coming out of the woodwork" for the Queen's Jubilee. The Orchestra was founded in 1993 to play Vintage Big Band Jazz and Dance Music from the late 20's to the early 40's. The band's library is extensive, with about 400 numbers in "the book" and another 5000+ in the garage! In recent years the full-size band has given place to a smaller unit, due to the cost of up to 14 musicians. However, nothing less than a Big Band would do for the Queen's Jubilee. A 12-piece band (reeds: Alan Marshall, Gavin Lee, Jim McBriarty, Sue Ferris; brass: Mick Hill, Alan Smith, Neville Hartley, Don Fairley; pno: Brian Chester; gtr : Roly Veitch; bass : John Carstairs Hallam; dms: Ian Forbes) plus vocalist Ruth Lambert will be playing at the re-opening of the restored Tynemouth Station on Monday June 4. CD Review: Clara Ponty "Into The Light"
Lyrics mostly by Mike McGurk. 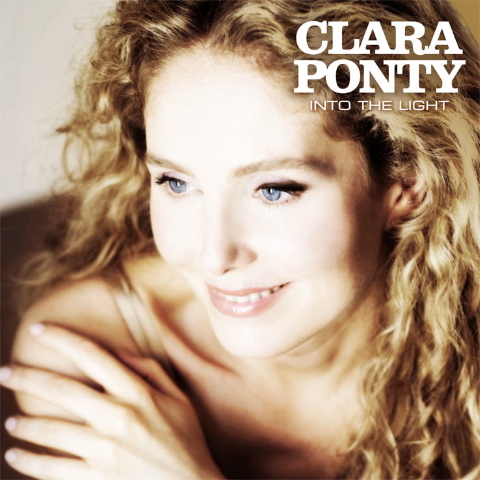 Produced and Arranged by Stuart Bruce and Clara Ponty. This is a hard-to-classify CD, it isn’t out and out jazz as there’s not a lot of improvising, (at least I think not) but it’s very pleasing to listen to and I suspect that it will grow in interest the more you play it. The songs would go well with a sub-titled French film, songs that sound more lightweight than they really are, sung in a light sweet voice, with every word crystal clear. To call the music rock or pop isn’t adequate, and the sleeve notes mention elements of pop, jazz, classical, Celtic, West African and folk, as well as influences of such as Debussy and Steve Reich, though I didn’t hear any hints of that latter avant-garde composer. Watson, Walker and Edis - Lunchtime gig at the Lit and Phil. This trio first performed a one-off set as part of the ‘Jazzathon’ at the Lit and Phil in 2011 to great acclaim, and indeed it was later voted ‘best gig of the year’ by local jazz blog Bebop Spoken Here. All three musicians were keen to continue collaborating and to explore the many possibilities of this new ‘baseless-trio’. With an ever expanding portfolio of compositions, an abundance of technique, innate sensitivity and interaction, the trio draw upon a wealth of experience and influences to perform original and moving music with improvisation and expression at its heart. Friday June 8. Literary and Philosophical Society, Westgate Rd., Newcastle. 1:10pm-2:00pm. £5/£3. Ray Dales' Quartet @ Hoochie Coochie. Thursday May 17. Ray Dales (alt); Jeremy McMurray (pno); Peter Ayton (bs); Richard Brown (dms). If these Teessiders were footballers Middlesbrough would be in the Premier League! Ray Dales is a sharp-shooting, sure-footed, alto-saxist who soars Birdlike through the changes. Nice round sound with lots of technique that allows the ideas to flow. On keys, Jeremy McMurray also displays a deft, almost classical, touch using all of the 88 (or in this case 72) notes available. The piano is pounded into submission and the instrument doesn't object at all - just gives an orgiastic moan of musical pleasure. Peter Ayton fertilizes the growth with bass guitar lines that complement and inspire whilst on drums Richard continues to demonstrate the art of making any rhythm swing. And there were many rhythms tonight - Calypso, Mambo, Samba, Bossa to name but some. That this was one of the lesser populated Hoochie gigs was no reflection on the band - those stay away jazz people don't know what they missed (are missing) on a rainy Thursday night in Newcastle. Next week it's The (New) Narrators. Michael Brecker was a genuine jazz titan, a saxophonist with a distinctive sound that made him the most imitated jazz musician of the past twenty-five years and that graced countless pop and rock recordings by artists including Steely Dan, Paul Simon and Frank Sinatra. A composer of conspicuous talent, Michael was joined by his brother, Randy, as his frontline partner in the Horace Silver Band, fusion pioneers Dreams and the funky, hard bopping Brecker Brothers. The SNJO, with Randy on trumpet, celebrates his music from the Brecker Brothers’ 1970s heyday through to the beautifully reflective atmosphere of his 2003 album, Wide Angles. 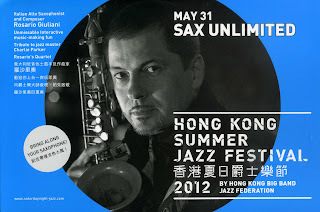 For details of all concerts go to www.snjo.co.uk. Also well done to SNJO for picking up the Parliamentary Jazz Award for the best jazz ensemble of 2012. Congratulations to the winners, condolences to the runners up. As many of you know I've a longstanding interest in our tradition of local dialect songs, the history, the composers etc. Also its soon to be the 150th anniversary of The Blaydon Races song and the legendary meeting of 9th June 1862. The Races actually started in 1811 ending in 1916 (not continuous though) - I've put a history of the Races on my website as well as some other aspects of Blaydon area history - the amazing story of Sir Ambrose Crowley and Crowley's Crew, of The Cowens (Joseph Snr & Jnr), of Blaydon Burn (possibly the most industrialised patch of land in England prior to the industrial revolution) and other bits and pieces plus photos now and then etc. Visit www.rolyveitch.20m.com. 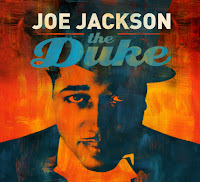 ‘Historically fascinating’ – Jazz UK. 'Tailor made for Live Theatre or Sage Hall Two' - Lance (Bebop Spoken Here). 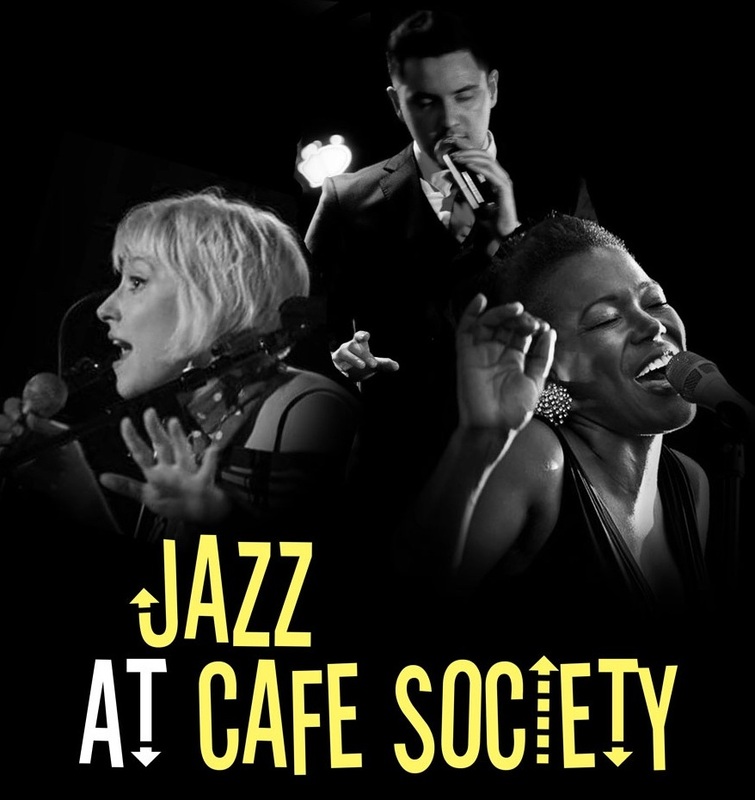 Three of Europe’s top young jazz vocalists - Gwyneth Herbert, Alexander Stewart and Paris-based China Moses (daughter of jazz giant Dee Dee Bridgewater) star in this swinging show about the legendary New York nightclub which promoted racial equality and progressive causes. 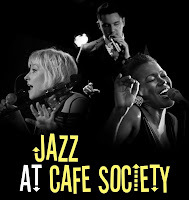 From 1938 to 1947 Cafe Society played host to some of the finest musical talent of the 20th century, including Billie Holiday, Lena Horne, Sarah Vaughan, Count Basie and many others. I happened on your website while searching re the recent death of Joe Young, (a real gentleman), who I knew from the old days and played with a couple of times. It raised many memories for me of the Tyneside trad jazz scene of the 50's and later. I was at school with Peter Gascoigne and played piano in an early band featuring him and Ronnie Robinson (about 1952). Before long Peter G left to join Peter Deuchar's Vieux Carré Jazzmen group. Since Deuchar felt that "pure" New Orleans style was derived from marching bands, piano players were a non-requirement so I then joined Eric Miller's Castle Jazz Band in about 1953 , playing piano to support Eric (a fine trumpet/cornet player), Ronnie Robinson clarinet and John Wheatley (tuba) - We played a number of gigs at the Royal Arcade and elsewhere. (The style leaned in the direction of Louis Armstrong and King Oliver). After Ronnie Robinson left to join the Vieux Carre, the Castle Jazz band had difficulty fielding a full team (the VC/Ken Colyer style having more support). End of the innings for Frank Parr - wicket keeper and trombone player. 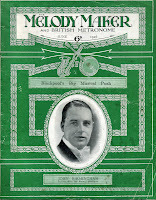 Frank Parr kept wicket for Lancashire and played trombone with Mick Mulligan. In his Independent obituary he is quoted thus: "I've been extraordinarily lucky, I've made a living out of the two things I loved." Frank died May 8 aged 83. 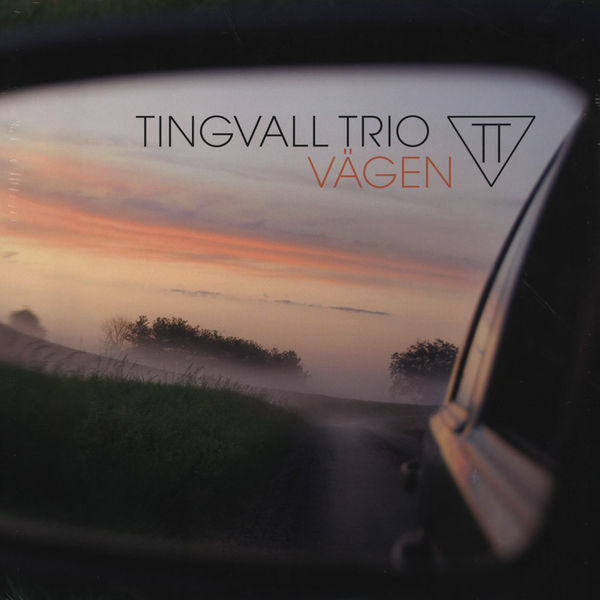 CD Review - The Tingvall Trio: Vagen. (Review by Lance.) In a few short years the Tingvall Trio has become known as one of the top young European Jazz ensembles, winning the prestigious German ECHO Jazz award twice (2010 and 2012) as “Best German Jazz Ensemble”. They are one of a series of piano trios following in the footsteps of the legendary e.s.t. using breathtaking ensemble work and beautiful melodies to bridge the gap between jazz and pop. Big band enthusiast Tony Eales is the guest speaker at Bishop Auckland Jazz Record Society tomorrow (Wednesday 16 May, 8:00 pm). His subject is Wigan Jazz Festival. Tony's illustrated talk will cover 20 years of Wigan festivals. The society meets at the CAMRA award winning pub the Ship Inn in Middlestone Village, County Durham. DL14 8AB. When Harry (Connick jr.) Met Roly (Veitch). Keith Crombie's 'Jazz Cafe', still going strong in Newcastle, is the stuff of legend. Someone should write a book about it. There are countless anecdotes. One memorable event took place on the 11th June 1993. It was one of those experiences as a musician you never forget. That evening we had a quartet playing there - Bill Harper pno, Clem Avery bass, Miles Nicholas drms and myself gtr/vcls. Miles was a great drummer who had recently completed the music diploma at Newcastle College, he later emigrated to Australia and I often wonder what happened to him. He had a wonderful ability to 'swing'. Also present that evening was the very young Paul Booth (with dad Eric) - even then he was amazing. Well the word had gone round that some of Harry Connick's band may be dropping in for a blow - they had a concert at Newcastle City Hall that same evening. There was a palpable air of anticipation and excitement. Would anything happen? More Melody Maker Archive Update. 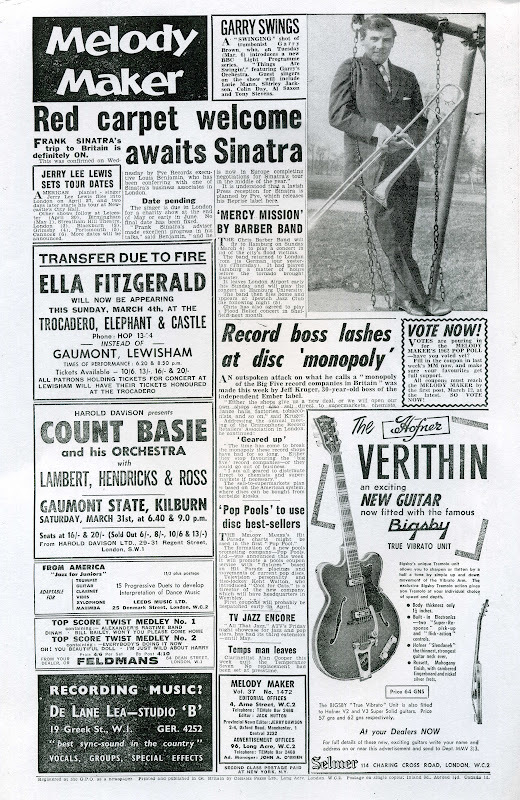 Colin Aitchison is streamlining his vast on-line collection of Melody Makers. Included in these two batches is perhaps the most famous headline of them all - Glenn Miller is Missing. It is fascinating to read complete issues from 70/80 years ago. This is surely the definitive history of jazz and dance music in Great Britain. earMUSIC, the Hamburg based rock label which is part of Edel Group, is proud to announce the release of “The Duke”, a tribute to jazz icon Duke Ellington. 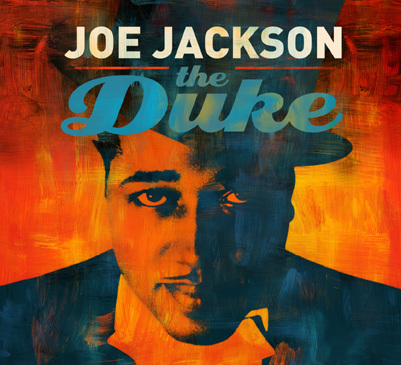 Though “The Duke” is a tribute album, it's also very much a Joe Jackson album, consistent with his long-standing sense of musical adventure. 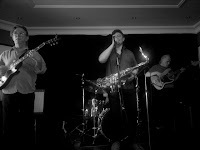 What A Day This Has Been... Singin' The Blues in Manchester - Fusionhead @ The Bridge. Roz Sluman (alt/ten/vcl); Nick Rimmer (keys); Alex Green (bs); Kenny Reed (dms). The day had begun with football, not a subject we digress upon too much. However, today was special for Manchester, Newcastle (faintly) and Sunderland. At the end of the day Man City won the plaudits and it was Man U who were "Singin' The Blues" - Newcastle didn't make the Champions League and Sunderland didn't make the Top Ten. So, to the music which, at the end of the day, supercedes overpaid foreigners kicking a ball around. Fusionhead, tonight's Splinter/JNE headliners, play funky jazz with a solid 1970's feel. "I was there" we cried as the band stormed into a number reminiscent of yore. Sluman plays for keeps - her alto playing strips the paint from the ceiling reminding us of Hank Crawford with maybe just a grain of Sand(born) added to the recipe. On tenor the lady from Cumbria cries out musically that this is how they walk the bar in Downtown Carlisle!. Vocally she gets the feel and conveys it well. With a solid rhythm section behind the band rocked and rolled, funked and souled. This was music aimed at the feet rather than the mind - Hoochie Coochie material perhaps? The funeral of guitarist/double bassist (Mighty) Joe Young will take place tomorrow (May14) at St Bede's Chapel, Teesside Crematorium, Acklam Road, Middlesbrough, Cleveland, TS5 7HD at 2:30pm. Our condolences go out to Diane, Julian and family. The Scottish National Jazz Orchestra follows its highly successful and critically acclaimed celebration of jazz-rock pioneers Weather Report’s music with a four date Scottish tour in May paying tribute to the late, hugely influential saxophonist Michael Brecker, featuring Brecker’s trumpet-playing brother, Randy, as guest soloist. 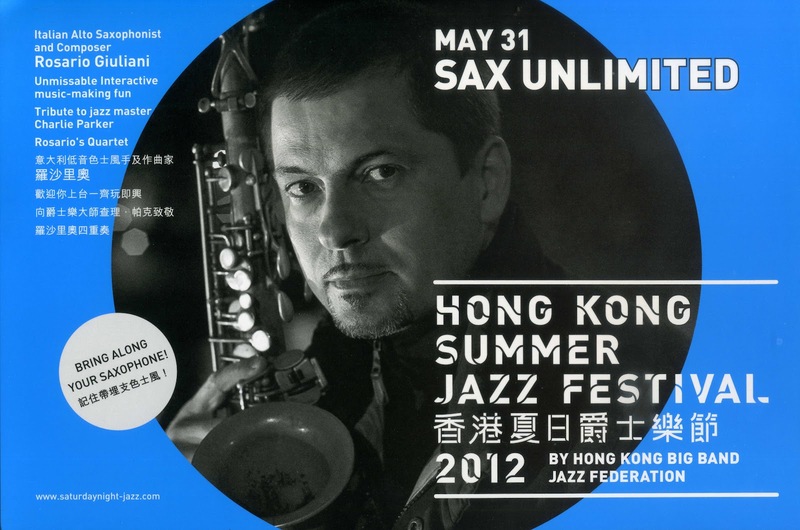 As well as featuring on innumerable pop and rock recordings by artists including Frank Sinatra, Paul Simon, Steely Dan and Dire Straits, Michael Brecker, who died aged fifty-seven in 2007, was revered in jazz circles for his deeply resourceful improvising and a distinctive tenor saxophone tone that made him the most imitated saxophonist of the past twenty-five years. Our man in Hong Kong - the intrepid Colin Aitchison - sent me this rare poster of Peter Fielding and his Band who, many years ago, were resident at Newcastle's Oxford Galleries. Colin tells me the poster dates from around 1936. I thought Fielding's tenure at Newcastle's once most famous ballroom began a little later although the uniform of the lounge lizards pictured tallies with the era. I wonder if anyone can put names to the faces? Also, did Peter Fielding's Band record? Sounds like a case for John Carstairs Hallam. How do I write a review of a gig performed by my jazz-singing class teacher? Such a task could be embarrassing, but there’s no problem with this band because I knew they’d be good and they were, (and then some, as Lance would say)! Some of the band had come straight from other commitments, such as work, but they zoomed into jazz mode with no messing about, beginning with an inventive chorus of There’ll Never Be Another You’, complete with keys and bass solos and introductions of the band members from Lyndsay. How she manages to sing miles away from the original tune and yet still connect with it is an enviable skill, intriguing to listen to. CD Review: Nicky Schrire - Freedom Flight. Nicky Schrire (vcl); Nick Paul (pno); Sam Anning (bs); Jake Goldback(dms/perc); + Paul Jones (ten on 2 tracks); Jay Rattman (clt on 2 tracks); Brian Adler (perc 1 track); Peter Eldridge (pno 1 track, vcls 1 track). London born, South Africa raised resident of New York City Schrire (pronounced Shruy-er) displays elements of all three countries in this her début CD. Opening up with the title number that segues into the Beatles Blackbird - yes that tune's turned up again - her British roots are catered for and South Africa is represented by Jo'burg based Carlo Mombelli's Me, the Mango Picker. Stateside material is provided by Lerner and Lowe's If Ever I Should Leave You, Dylan's Don't Think Twice, It's All Right and several others including some compositions of her own. Whitley Bay Classic Jazz Party - Sold Out! This event is now sold out, so please don't send us any money. However, if anyone would like to be placed on our waiting list, in case we get any cancellations, they should send their contact details to us at wbjazzfest@btinternet.com or by post to me at 60 Highbury, Newcastle upon Tyne NE2 3LN. ACV: Andy Champion (bass), Graeme Wilson (saxophones), Mark Williams (guitar), Paul Edis (piano) & Adrian Tilbrook (drums). Day two of Jazz North East’s Anglo French festival began in the best possible manner with a set from Andy Champion’s star-studded powerhouse quintet ACV. The second album is in the can and as is the way with these things will be released some time soon. The material in this set at the Lit & Phil was a mixture of the familiar and the not so familiar. Giant Mice, What’s For Breakfast? and Dust Red have become audience favourites, there was a new number from reedsman Graeme Wilson and a reflective composition from bandleader Champion – Second Season - sounded good on first hearing. Wilson and guitarist Mark Williams reeled off solos with ease, so too pianist Paul Edis. Champion and drummer Adrian Tilbrook drove the band with no little enthusiasm and all brought something to the party on the outrageous Without Bones. Howard Alden Quintet @ Bois(terous)dale. May 10. Howard Alden (7 string gtr); Karen Sharp (ten); Simon Woolf (bs); Sebastian de Krom (dms); Jeanne Gies (vcl). One may be forgiven for thinking that the presence of one of the world's great jazz guitarists - a living legend - would have the audience sitting in hushed silence in awe of greatness. Fat chance! This is Boisdale where the volume of noise from the crowd makes the mob at Hoochie Coochie seem like a meeting of Whisperers' Anonymous! Nevertheless, for those prepared to listen, and this includes a charming couple - Leanne and Drew - whose acquaintance I was delighted to make (our views on jazz, the venue and the gig ran parallel), there was some great jazz played. Opening up with I Hear a Rhapsody Karen Sharp took the first solo. Her rich full sound proved you don't have to be a man to blow masculine tenor! Karen ably carried on the tradition begun by Kathy Stobart and Barbara Thompson. Enter Alden with a solo that really should have been appreciated by more than the select few paying attention. This was George Van Eps, George Barnes, Bucky Pizzarelli and, most of all Howard Alden. L’Entente Chordiale @ The Lit & Phil. May 9. Recession? What recession? 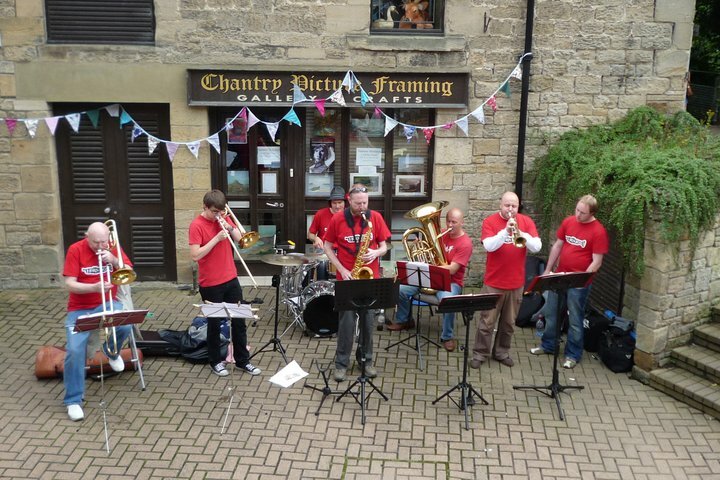 Jazz North East’s latest venture – a two day Anglo French mini festival – went ahead despite the decimation of Arts Council funded activities. flight – and at times they were up there flying with the albatross – Spelk is one exhilarating experience. Jenny Williams Quartet/Alec Harper Quartet @ The Spice of Life. May 9. Jenny Williams (vcl); Ed Blunt (pno); Gili Lopes (bs); Dan Ingamells (dms). Alec Harper (ten); Matt Robinson (pno); Calum Gourley (bs); Dave Hamblett (dms). (Review by Lance). Photos by Joanna Wallfisch. Foreign Land. Harper has a dry sound that suited the mood of the piece. Another original - The Last Episode - moved things up a notch with some fast, hard-blowing tenor that would have done credit to Ernie Watts last night at Ronnie's. He dug in deeply justifying the applause that followed. Another epic performance came from pianist Robinson who displayed a Tyneresque approach that didn't hurt a bit. A rather beautiful ballad - Everything I Love - displayed the romantic side then deeper emotions as it became climatic before subsiding back to tenderness. More emotive playing in a piece dedicated to Harper's late grandfather Toby followed by a journey to Never Never Land. Hamblett had a big feature on this one whilst Gourley steadfast and strong all night held everything together. Ernie Watts (ten); Christof Seenger (pno); Rudi Engel (bs); Heinrich Koebberling (dms). A near capacity Ronnie's were duly captivated by the astonishing tenor playing of Ernie Watts. Think Hank Mobley, then Coltrane, Brecker and maybe a few others and you're getting the idea. His technique is prodigious but it isn't all technique. Watts can be doing Formula One with the pedal pressed to the floor and then, he's taking a stroll in the park, before revving up the motor again. I swear he's got six fingers on each hand! This is a guy surely at the pinnacle of his career exploring every tonal inflection and combination lesser mortals can only dream of! TASTES - More Tales From The Widow's Kitchen by Laurie Pepper. Check out a previously unreleased version of YI Blues by Art Pepper (sounds like a Geordie tune!) from the indefatigable Laurie Pepper. Dean Stockdale Quartet @ The Cherry Tree. Dean Stockdale (pno); Jimi Savage (gtr); Neil Harland (bs); Keith Hill (dms). I began my Monday repast with Black Pudding Fritters and Apple Purée - So What? I hear you say which is what I hear the band play. Stockdale is an able pianist who lists a stint at London's Savoy Hotel on his cv and is certainly a welcome addition to the region's keyboard fraternity. Jimi Savage, the name and the spelling suggest some Neanderthal Hendrix axeman, turned out to be a tasteful player who also operates a guitar studio in Newcastle Arts Centre. Neil Harland, the eternal Man For All Seasons is cucumber cool and Keith Hill did just enough to keep the Way You Look Tonight swinging. Gabriele Heller (vocals), Paul Beck (piano), Steve Glendinning (guitar) & Dave Parker (double bass). Gabriele Heller is a graduate of Lindsay Hannon’s jazz vocal class at The Sage. I first came across Gabi when she sat in at Dave Weisser’s jazz workshop at The Chillingham. First impressions were good; a presence, dark, low register vocal delivery, eager to play with the lyric. Since that first hearing Heller has gigged intermittently, picking up a band along the way. She combines an exploration of early or ‘classic’ jazz vocal styles, the blues, well-chosen standards and a smattering of original compositions. An invitation to perform at Splinter at The Bridge represented a significant development in her fledgling career as a jazz singer. I've just received the sad news that John Young - better known as guitarist.bassist Mighty Joe Young has passed away aged 80. Joe had suffered from Dementia for a number of years and recently was suspected of having a trace of lung cancer. I first encountered Joe at the New Orleans Jazz Club in Newcastle where he led one of the area's first modern jazz groups. Colleagues included pianist Bill Harper, saxist Jeff Hedley, trumpet player John Walters, drummers Ian Forbes and Jacky Denton to name but a few. He later crossed the stylistic divide playing with the Vieux Carré Jazzmen on double bass. Bill Harper wrote a lovely piece last year on Joe which I've linked to here. Our thoughts are with his dear wife Diane. PS: Funeral arrangements will be announced when known. James Taylor (Hammond/vcl); Guitar, Bass, drums + Yvonne Yanney (vcl). This was an adrenalin pumping evening! James Taylor makes - say Wild Bill Davis or Bill Doggett - sound like the old lady who plays the organ in your parish church! Mind you, whilst Wild Bill and his ilk painted much broader harmonic pictures than Taylor - whose stock in trade is excitement - they couldn't match him for aggressive, kick the door down power. He's more percussive than most drummers! This was funky, soul fuelled - somebody said "Acid Jazz" - that placed his Hammond under ten times more pressure than even Mike Carr did - albeit without the finesse. 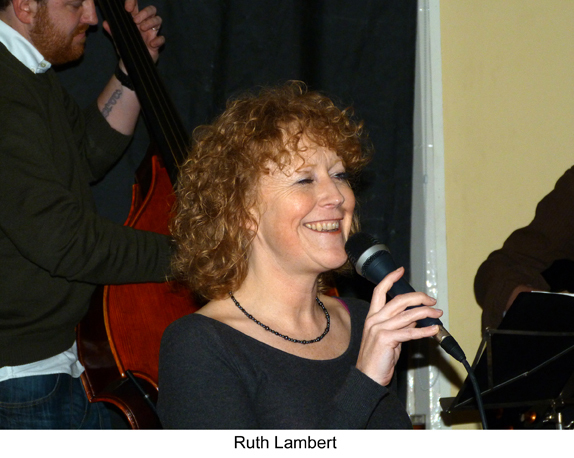 Ruth Lambert Quartet. Ashington Jazz Club. Wednesday May 2. Ruth Lambert (vcl); Graham Hardy (tpt/flug); Mark Williams (gtr); Andy Champion (bs); Tim Johnston (dms). The last visit of Ruth to Ashington Jazz Club sadly had to be cancelled due to severe winter conditions and our members have been waiting patiently for her return. Our patience was rewarded on Wednesday. with a visit that proved to be well worth the wait. We often say that one swallow doesn’t make a Summer but the return of this song bird gave us all a feeling that warmer days could not be too far ahead. Unfortunately, with Newcastle AFC on the verge of glory at Chelsea (TV broadcast) and with some members basking in the sun of foreign shores, our attendance was reduced, but nevertheless this did not affect the quality of the evening performance. My First Ever Jazz Record Request. Alyn Shipton, on BBC Radio 3's Jazz Record Requests, kindly played my suggestion for a record to remember the late Teddy Charles by. Vibraphonist Charles, who died last month, is featured on Wardell Gray's Paul's Cause. It's about 53 minutes into the program. Russell, who told me that it had been played also drew my attention to the second disc played - Nikki Yanofsky's version of Ella's famous recording of Mr Paganini , recorded when Ms Yanofsky was only 16, it stands up well against Ella's version. Thought you might be interested in a couple of clips that were passed to my Dad (Roy Willis) by an old friend the other day...In the 80's, my Dad was part of the George Evans Big Band and used to meet up with him every week for a bit of a jam session in our front room (which I loved!) - as a result of it, George and my Dad were asked to play for Valentines Day on an arts programme on TV at the time called The Gallery. Here's a clip of it that you may be interested to share on your blog. I'm not sure of the exact year but my Dad certainly had more hair in those days! The other clip I got on the same disc was of George Evans with the Arthur Mowat Big Band at the Corner House in the 80's too - lots of familiar faces to spot in the band too! Bud (Powell) Goes to My Head. Listening to Bud Powell on 'Tube - You Go To My Head. perfect! The (cold) wind of change blows across Radio 3’s jazz output this holiday weekend. Jazz Record Requests has a new presenter (the excellent Alyn Shipton) as long-time host Geoffrey Smith moves over to the graveyard shift (midnight) to present a new weekly programme imaginatively titled Geoffrey Smith’s Jazz. Radio 2 visits the Cheltenham Jazz Festival, on Sunday Wogan (yes, Terry Wogan) gets in on the act and Gil Evans is remembered in this the centenary year of his birth. Conte Candoli (tpt); Frank Rosolino (tmb); Bud Shank (alt); Richie Kamuca (ten); Russ Freeman (pno); Monty Budwig (bs); Barney Kessel (gtr); Shelly Manne (dms). OK so that wasn't the real line-up but close your eyes and it could have been! Actually it was Kevin Eland (tpt/flug); Eddie Bellis (tmb); John Hudson (ten); Alan Marshall (alt); Bill Brittain (pno); Alan Rudd (bs); Roy Willis (gtr); Paul Wight (dms) who created the illusion that we were hearing a band from LA when in fact it was pure home grown talent! Lickety Split have found a niche that was screaming out to be filled. Screaming out to be filled by an audience that neither wanted to be Taken Back to New Orleans nor had any inclination to view life On The Outside. LS (silly name does nothing to pull the audience they aim at) has some great soloists - each and every one comparable with their LA counterparts. The arrangements are terrific (including a couple by Sunderland's Ray Chester). Fryering tomorrow night (MAY 5) not next week! We have just realized that the original printed leaflet for the Trinity Centre gig had the wrong date on for Jim Fryer, down as 12th May, which we had noted. Appears they reprinted the leaflet……..with the 5th May correct date. 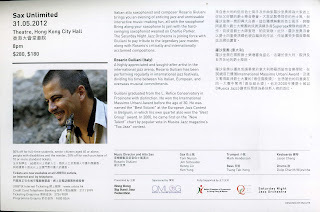 May be worth a note on Bebop for others like ourselves who had not yet bought tickets but were intending to go along. More on the Jazz Baroness DVD. One Morning in May - today perhaps?